being MVP: Springfield Dolls + GIveaway! My cousin received Springfield Dolls for review with her daughter, Ashlynn, and here are her thoughts. My daughter received ‘Emma’ ($21.99) from Springfield dolls. 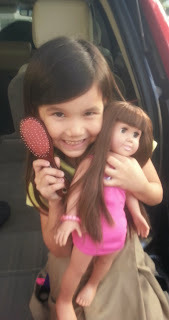 She was so excited to get the doll that she had seen in the picture I had showed her on the website. She has a few other 18” dolls from other companies but this was her first Springfield doll. She has been vying for another doll for quite some time so I was happy to find that the Springfield dolls are much more affordable without compromising on the quality of the doll. Ashlynn had chosen Emma because she looks like her, with brown hair and brown eyes. When Emma arrived in the mail, Ashlynn couldn't wait to introduce her to her new friends. She wanted to take Emma out in the car with us everywhere we went. 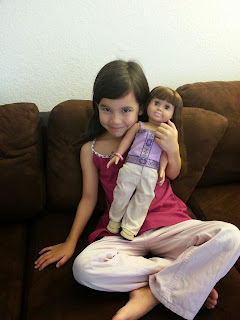 My daughter’s friends were all falling in love with her new doll as soon as she showed her to them. Ashlynn could not stop commenting on how beautiful and smooth Emma’s shiny hair was. She loves to brush her new doll’s hair. I love that she is old enough to play with dolls like this now. I had some dolls like these when I was a girl and watching my daughter play with her new Springfield doll brings back fond memories. The Emma doll, like all the Springfield dolls, comes with a little bio about her, explaining that she dreams of one day becoming a teacher, that she loves dogs, and that she enjoys swimming. There are five different dolls sold by Springfield, so girls are able to find one that suits them best. I love that these dolls encourage imaginative play, and they are made so durably that I don’t have to worry about anything. 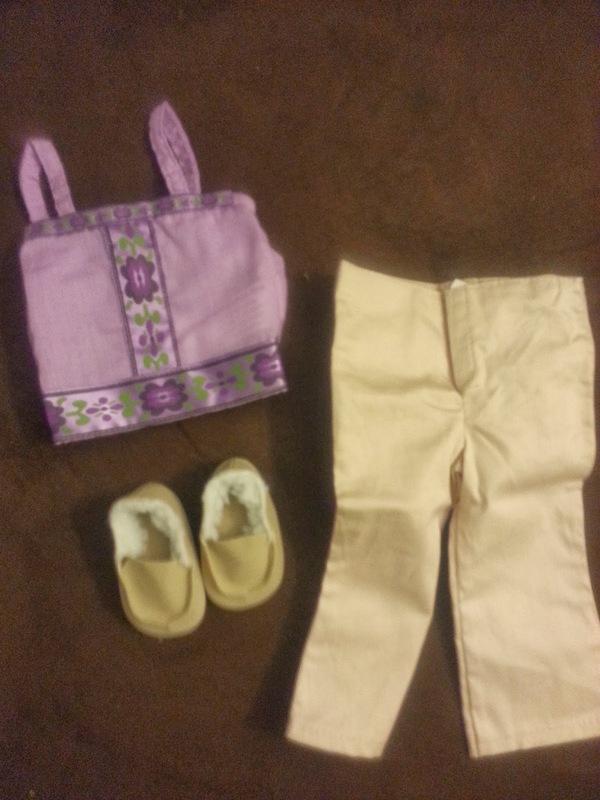 We also received an extra outfit for Emma. My daughter received the Bohemian shirt with pants and the moccasins ($8.99). She was excited to be able to change Emma’s outfit. It’s great that the outfits are compatible with other 18” dolls because she can mix and match outfits with her other dolls that are from different companies. She was excited that Emma was able to share and swap clothes with her ‘new friends.’ And I was glad to find out that the outfits from Springfield were more affordable than others that I have purchased in the past. We will definitely be buying all of our dolls’ outfits from Springfield from now on. Springfield has a wide selection of adorable outfits to choose from. They also carry accessories such as glasses and shoes. My daughter was excited when she saw the furniture on the website. She is wishing for a bed for Emma and a vanity with bench for Christmas this year. Make sure to connect with Springfield Dolls on Facebook, Twitter, Pinterest and Style Club! One winner will Receive Choice of Springfield Doll + a special outfit and shoes chosen by the Springfield Collection! I love the Emma doll for my beautiful daughter Madison! I would choose Abby for my daughter. She would love her! I'd choose Emma for my dd! Olivia for my youngest daughter. Id pick Emma for my middle granddaughter because of her hair. I'd choose Abby for my daughter. 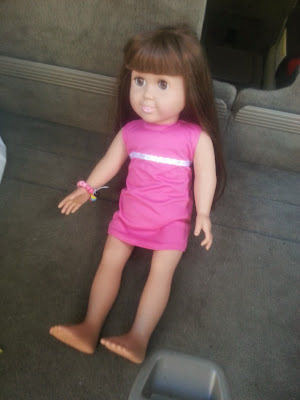 I would love to win the Abby doll for my granddaughter, Nellie. I'd choose Emma for my daughter! Thanks so much for the fantastic giveaway! I would love Olivia for my daughter Hailey! I would choose the Emma doll for my granddaughter. I would choose the Emma for my 5 year old daughter. My daughter would love Emma. I like that it comes with a story on the box. I would choose Olivia if I were to win and it would be for my granddaughter. My favorite Emma because she kinda looks like my friend's little girl. I like Emma or Abby for my daughter. I would get Maria for my daughter. I like the Abby doll for my daughter. Thanks! My daughter would love Emma! I would like Emma for my niece! Abby or Emma, as my girls are blonde and brunette, my girls would love these "babies"
I would choose Abby for my granddaughter.